The use of telemedicine has been increasing steadily over the last several years, and it is about to explode. According to a study by Parks Associates, the number of households using video consultations will grow from 900,000 in 2013 to 22.6 million in 2018. Many of these visits will be conducted through one of the fast growing online-only providers. Online-only physician’s services, such as Doctor on Demand and Amwell, provide convenient access to doctors who treat a variety of medical and mental health conditions using video and audio over the internet. Patients can receive care 24 x 7 without leaving their home or office. It’s easy to see why these services are so popular. They are quick and easy and increasingly covered by insurance. Patients are spared the time and cost of travel, they don’t have to sit in a crowded waiting room, and they don’t need to miss time at work. It’s also not surprising that patients between the ages of 18 and 34 are the most frequent users of these services. They do everything online, why not visit the doctor. How Does a Traditional Practice Respond? Of course the traditional medical practice isn’t going anywhere. There are still many types of cases that require an in-person visit, and long term doctor/patient relationships are good for health outcomes. Most people will maintain a traditional relationship, while supplementing it with on-demand care. But do practices need to cede all of that potential revenue to the competition? Not at all. 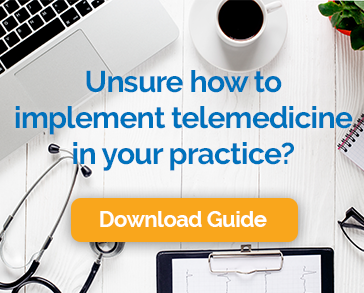 Telemedicine technology makes it possible to integrate video visits into your practice. You can still see patients in person, but offer telehealth as an alternative for follow-up visits, medication checks and even urgent care. The approach opens up the opportunity to provide services during non-traditional office hours without adding office staff. The old saying goes, “If you can’t beat ‘em, join ‘em.” When it comes to technology, the genie is out of the bottle and people won’t give up the conveniences that it has enabled. That’s OK, and the competition won’t hurt your practice, as long as you take advantage of new capabilities to provide more and better service to your patients.